It’s easy to forget about what America looks like when you go to the movies. Too often films look like suburban commercials or show us the same 4 big cities. But the truth is, a majority of America looks like the films Jeff Nichols is making. Nichols first film, SHOTGUN STORIES, was set in the woods of Arkansas. His wonderfully crafted 2010 film, TAKE SHELTER, was set in the fields of Ohio. MUD takes us to the shores of the Mississippi River. These settings are instantly appealing and recognizable. They feel more like home than most films released. Nichols uses these settings as a sort of character, and it makes MUD a wonderful place to be for a couple of hours. MUD revolves around two young boys from Arkansas, Ellis (Tye Sheridan) and Neckbone (Jacob Lofland). While both boys face turmoil at home, they escape it by taking their boat out on the Mississippi to explore an island in the middle of the river. On this island the boys find a boat stuck in a tree. They quickly realize this boat has an inhabitant, Mud (Matthew McConaughey). The two boys want the boat, while Mud, who is seemingly homeless and without resources (except for what he values most, his shirt and gun) wants food. A deal is made. If the boys help get food and supplies while he is temporarily on the island, the boat in the tree is theirs once he gets off. 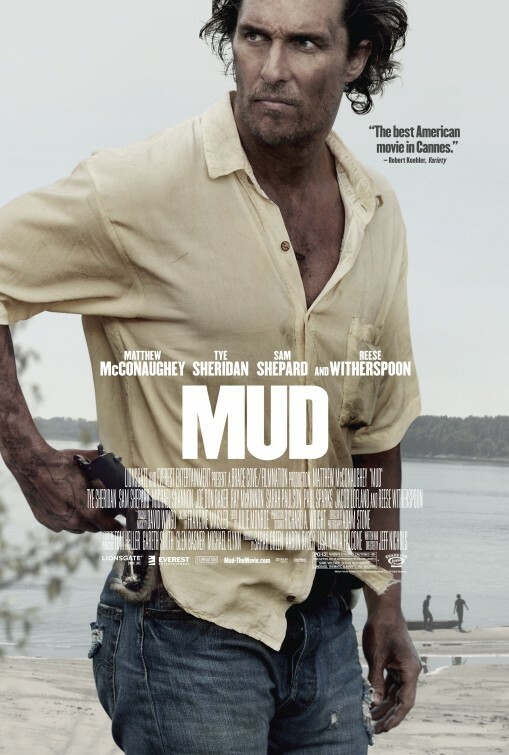 The title of the film might belong to Mud, but this is Ellis’s story. Mud only exists through the eyes of this fourteen year old. A boy who is quick to throw a punch, fall in love, deal with his parents pending divorce and attempting to help get Mud off the island and to the love of Mud’s life, Juniper (Reese Witherspoon). The problem is, as Ellis and his best friend Neckbone find out, Mud is wanted for murder and is being hunted by local police and bounty hunters (who are very intimidating relatives of Mud’s victim). The boys struggle to find out the truth in it all, but no matter what Ellis and Neckbone are stuck in the middle. MUD boils down to a film about love. The love we have, the love we're waiting for and the love that's always just out of our reach. Mud's love for Juniper is unyielding. Whether she loves him back doesn't matter. His love for her drives him in all he does. Throughout the film Ellis sees love in every form. He aches as he watched the worst of love between his parents. His father who clearly loves his child, warns his son that love with a woman is a complex thing. On the other hand Ellis observes love in waiting between Mud and Juniper. Mud's overwhelming love for Juniper helps Ellis find hope. His attempt to find love of his own with May Pearl (Bonnie Sturdivant), a girl whose a few years older than Ellis, represents all of loves confusion. In the over two-hour runtime of this film you will meet many characters, characters you can’t help but care about. Each of these characters could carry their own movie, but all serve a part in Ellis’s story. It’s no mistake we become so invested. Nichols creates both atmosphere and depth. The triumph of MUD is its characters, led by our young lead Tye Sheridan (who captivated in TREE OF LIFE as well). He gives a performance to remember. His compassion, his anger, his curiosity all feels so familiar. We’ve all been Ellis in some way. Because of Ellis we too care for Mud. It’s Ellis’s trust in Mud that puts us at ease. Matthew McConaughey plays the part perfectly. Mud is a mystery, but we’re still cheering for him. We see that despite all of Mud's faults, he is ultimately driven by love, and how can you not root for that?